50. Landslide Blog – If You Like Failures - KJ Kuchling Consulting Ltd.
For those of you with a geotechnical background or have a general interest in learning more about rock slides and slope failures, there is an interesting website and blog for you to follow. The website is hosted by the American Geophysical Union the world’s largest organization of Earth and space scientists. 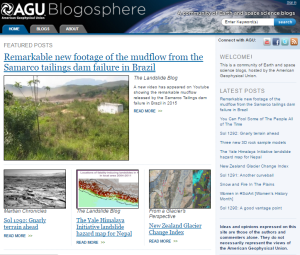 The blogs on their site are written by AGU staff along with contributions from collaborators and guest bloggers. The independent bloggers have editorial freedom in the topics they choose to cover and their opinions are those of their authors and do not necessarily represent the views of the American Geophysical Union. This provides for some leeway on the discussions and the perspectives the writers wish to take. 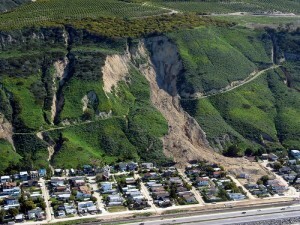 One specific area they cover well in their Landslide Blog are the various occurrences of rock falls and landslides from any location around the globe. They will present commentary, images, and even videos of slope movements as they happen. Often they will provide some technical opinion on what possibly caused the failure event to occur. The Landslide Blog has a semi-regular email newsletter that will keep you updated on new stories as they happen. The following links are a few examples of the type of discussions they have on their website. Here is a description of a small water dam failure in Greece. Here is some video of the Samarco tailings runout in Brazil. From time to time the Landslide Blog will examine mine slopes, tailings dams, and waste dump failures, however much of their information relates to natural earth or rock slopes along roads or in towns. Some of their videos are quite fascinating, illustrating the forces behind some of earth’s natural erosion processes. Check it out for yourself. The bottom line on all of this is that the less the mining industry is mentioned in the Landslide Blog, the better it is. Posted in: Operations, Tailings Management. Tagged: Environmental, Mine Engineering, Mining, Tailings. Cool stuff to look at when I have time. The big ones nationally include the Frank slide, wiping out the entire town of Frank, Alberta. That was a mining induced slide of around 60 million tonnes. What is most amazing is the distance the slide moved across the valley. If you visit the slide you must also head down the highway to visit the graves of the Hillcrest mine explosion. About 100 miners buried there…all of them between 16 and 25 years of age. Another biggie is the Hope slide, just outside of Hope, BC. I drive by it regularly on my way to Princeton. A more recent (2009 or thereabouts) one nearby is the Meagher Creek slide, which was roughly the same size as Hope. It occurred not far from Squamish…up the Lillooet River valley. Its a real interesting drive from Calgary to Vancouver through the Crowsnest Pass. Lots of geology and history lessons the whole way through.